Avant-garde rock group Light Upon Blight Ensemble returns for their fourth annual Halloween special on Friday, Oct. 26, this time improvising a live score to the 1926 silent film “Faust,” directed by F.W. Murnau. The show starts at 8 PM and there is a $5 cover. Costumes and other Halloween trick or treatery are encouraged and welcomed. “Faust” is a classic German Expressionist horror film. 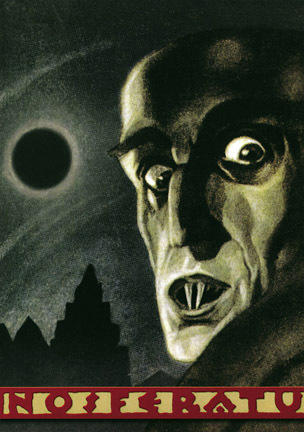 Based on Goethe’s classic retelling of the legend of a man who sells his soul to the devil and finds it a bad bargain, this version of “Faust” is directed by F. W. Murnau (“Nosferatu,” “The Haunted Castle,” “Sunrise,” “The Last Laugh”). Murnau had a bold visual imagination, distinctive even during the era of German Expressionism with its skewed perspectives and twisted rooms and stairs. He painted with light and shadow, sometimes complaining to his loyal cameraman, Carl Hoffmann, that he could see too much — that all should be obscured except the focus of a scene. “Faust,” with its supernatural vistas of heaven and hell, is particularly distinctive in the way it uses the whole canvas. Much like volcanic eruptions, Light Upon Blight performances are uncompromising acts of spontaneous destruction and creation. Purging and destroying the old while simultaneously laying new, fertile ground. No two Light Upon Blight performances are ever the same, just as nature intended. Sounds like: Free Jazz with a noise aesthetic or an exorcism. For this show, the ever-morphing personnel of Light Upon Blight are group leader Jeff Cedrone (guitar, synth, Bob Gorry (guitar), Conor Perreault (electronics, tapes), Peter Riccio (drums), and Brian Slattery (upright bass, violin). Elm City Noise Fest, organized by musician Conor Perreault, is a four-day, four-venue celebration of adventurous, improvisatory music. 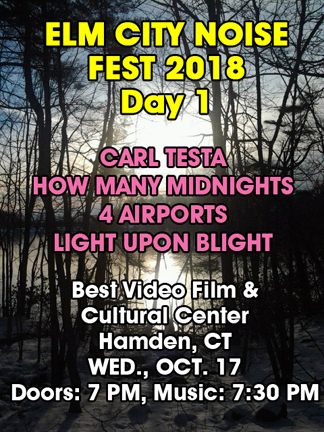 This year’s Noise Fest begins Wednesday, Oct. 17, at Best Video Performance Space with four acts: Carl Testa, How Many Midnights, 4 Airports (NY) and Light Upon Blight. Doors are at 7 PM and the music starts at 7:30 PM. The cover is $5. How Many Midnights features Bob Gorry (guitar) and Paul McGuire (alto sax) of New Haven Improvisers Collective, a guitar noisy feedback duo. Carl Testa is a multi-instrumentalist and composer at the intersection of improvised, electronic, experimental music, and new media. As a performer/improviser, he is equally comfortable on string bass, electronics, lighting, and combinations thereof. 4 Airports, from Beacon, NY, is a collaboration between guitarist Craig Chin (Errant Space) and synthesist Nathan Yeager (Campfire’s Edge). Together they create improvised electronic soundscapes, exploring weird sonic terrain and deep ambient textures. Light Upon Blight performs in many different configurations. 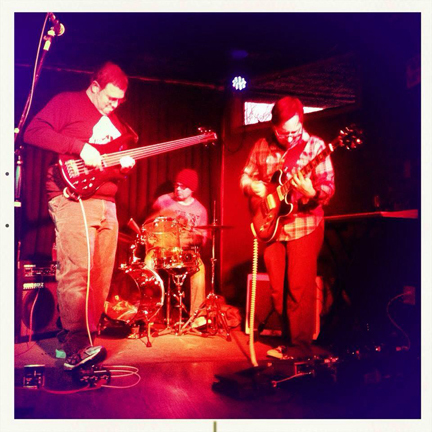 For this show, LUB will be a trio consisting of Jeff Cedrone (guitar), Tom Hogan (drums) and Derek Monahan (bass). According to their Bandcamp page, LUB sounds like: Free Jazz with a Psychedelic noise aesthetic or an exorcism. Ernesto Cárcamo Cavazos, My Other Guitar and Light Upon Blight play Best Video Performance Space Wednesday, June 6. The cover is $5 and the show starts at 7:30 PM. 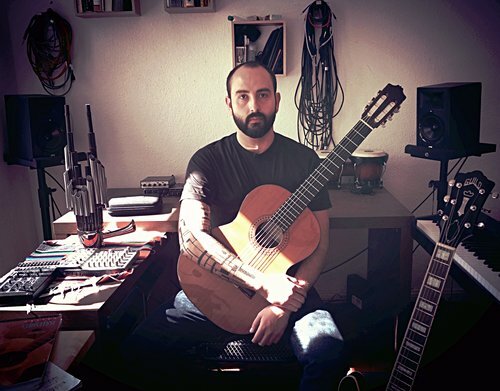 Ernesto Cárcamo Cavazos is a composer and guitarist of contemporary acoustic and electronic music. He received an Arts Bachelor degree in music composition from Brown University in 2009, under the tutelage of Gerald Shapiro where he received the Ron Nelson Award for Music Compositional Excellence. Directly following in 2011, he received an MA in composition from Mills College in California, having studied composition with Roscoe Mitchell and Fred Frith receiving the Margaret Lyon Prize for Outstanding Music Student. Upon finishing his studies he has been active in finding new approaches to composition, reflected in new music for acoustic and electronic ensembles, electronic improvisations , spatially-dependent pieces, and combinations of all three. Although artistically focused on musical experimentation and exploration, his approaches have adapted to fit a wide variety of genres and purposes in film and commercial composition. In My Other Guitar, Conor from Human Flourishing and Matt from Villager and Coke Divas and stuff do a twin guitar duo with their “other guitar” that they don’t mind breaking. Much like volcanic eruptions, Light Upon Blight—led by guitarist Jeff Cedrone—performances are uncompromising acts of spontaneous destruction and creation. Purging and destroying the old while simultaneously laying new, fertile ground. No two Light Upon Blight performances are ever the same, just as nature intended. Sounds like: Free Jazz with a noise aesthetic or an exorcism. Light Upon Blight plays Best Video Performance Space this Friday, Feb. 23. 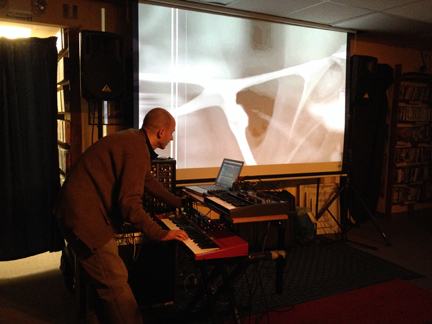 Musician John C. Miller—going by the name Avmus—opens with a solo electronics set and accompanying video. The show starts at 8 PM and the cover is $5. Light Upon Blight will perform music inspired by the works of William S. Burroughs. Much like volcanic eruptions, Light Upon Blight—led by guitarist Jeff Cedrone—performances are uncompromising acts of spontaneous destruction and creation. Purging and destroying the old while simultaneously laying new, fertile ground. No two Light Upon Blight performances are ever the same, just as nature intended. Sounds like: Free Jazz with a noise aesthetic or an exorcism. 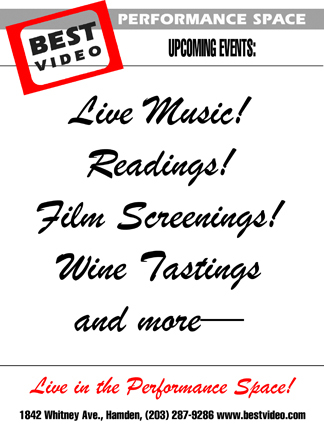 For this performance LUB will be: Best Video Film & Cultural Center’s own Richard Brown (alto sax), Jeff Cedrone (guitar), Thomas Martin (drums) and Peter Riccio (drums). Avmus is the audio/visual work of CT native, John C. Miller. For the past 15 years Miller has been creating a sense of a distant planet where Avmus serves as the soundtrack. The 1950’s film, ideology, and early electronic music influence the audio and visuals of Avmus. The music is created on guitar, synth, and violin that is sampled, tweaked, re-sampled and possibly tweaked once or twice more only to be re-sampled several more times using an old 4-track and Ableton Live. The process is as important as the product. A genre that Avmus fits in is hard to find, but for a generic label, electronic will suffice. Think Add N to (X) meets Tom Dissevelt and Kid Baltan’s “The Fascinating World of Electronic Music” with a strong influence of Caribou. 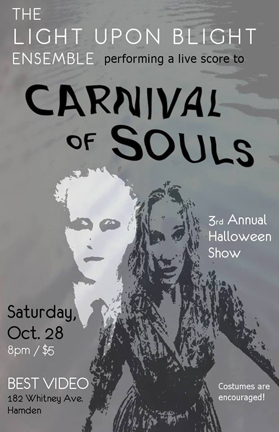 Avant-garde rock group Light Upon Blight Ensemble returns for their third annual Halloween special on Saturday, Oct. 28, this time improvising a live score to Herk Harvey’s 1962 horror classic “Carnival of Souls.” The show starts at 8 PM and there is a $5 cover. Costumes and other Halloween trick or treatery are encouraged and welcomed. Fifty-four years ago, director Herk Harvey made his atmospheric horror film Carnival of Souls, and in the time since, it has become not only a beloved cult classic but a landmark of American independent cinema. Made independently from the Centron Corporation, a company in Lawrence, Kansas, where Harvey had made several industrial and educational films, this low-budget feature was shot primarily at an abandoned amusement park on the shore of the Great Salt Lake in Utah. Initially released in drive-in theaters in 1962, Carnival opened to a limited audience as part of a double feature, but it left an indelible mark on those who did see it, like director George A. Romero. It wasn’t until 1989 that the film finally had a proper revival and was given a theatrical release in New York, establishing it as one of the most influential horror films of its time. The Light Upon Blight Ensemble is the jazzier & groovier off-shoot of the Psych/Free Improv/Doom/Noise project Light Upon Blight. 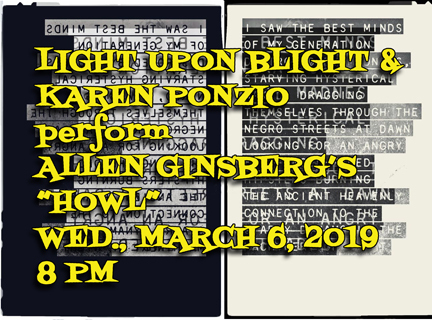 For this show, Light Upon Blight Ensemble features Jeff Cedrone (guitar, analog synth), Bob Gorry (guitar), Tom Hogan (drums), Pete Riccio (drums), Pete Brunelli (bass), and BVFCC’s own Richard Brown (alto sax). Avant-garde rock group Light Upon Blight returns for their second annual Halloween special, this time improvising a live score to F.W. 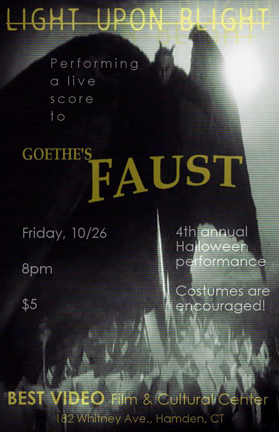 Murnau’s 1922 silent film classic “Nosferatu.” The show starts at 8 PM and there is a $5 cover. Costumes and other Halloween tick or treatery are encouraged and welcomed. “Nosferatu, eine Symphonie des Grauens ” (translates as “Nosferatu: A symphony of Horror”) is as masterpiece of German Expressionist filmmaking. An unauthorized adaptation of Bram Stoker’s “Dracula”—Stoker’s estate sued and won; fortunately, not all copies were destroyed as ordered by the court—”Nosferatu” was a sensation upon its release. 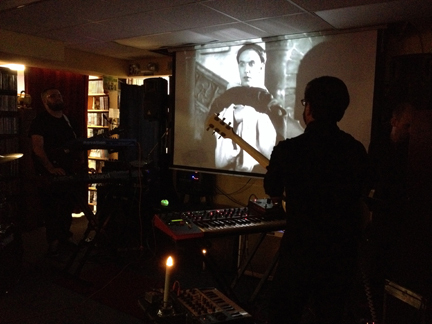 Light Upon Blight improvising a live score to “Haxan: Witchcraft Through the Ages” at Best Video Performance Space in 2015. 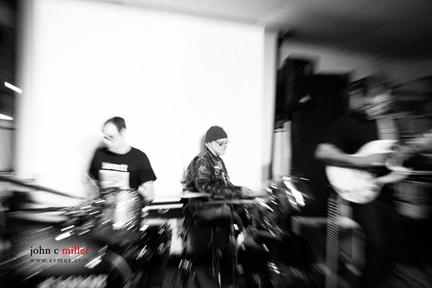 The group for this performance is Jeff Cedrone (guitar, synth, voice, electronics), Tom Hogan (drums, percussion), John C. Miller (synth, electronics), and Pete Riccio (drums, percussion). 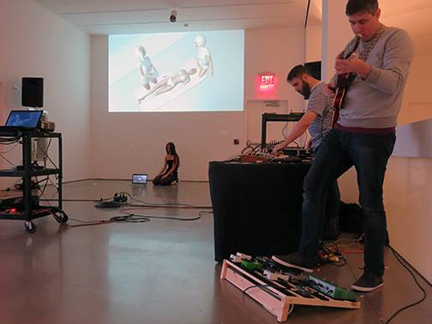 Experimental music groups Human Flourishing and Light Upon Blight play Best Video Performance Space on Thursday, Mar. 10. The music starts at 8 PM and there is a $5 cover. Human Flourishing—featuring Connor Pereault and Gregory Paul—explores the spiritual connectivity between people through the creation of tense sound environments in a variety of spaces. Whether located in an abandoned farm structure or a New York gallery, the audience is encapsulated by the experience happening before them; transforming the surroundings into an ethereal or satanical plane. Human Flourishing’s experimental sound horizons encourage inner reflection and spiritual connectivity to a world that seems isolated and cold. The resulting music is a celebration of fellow feeling. It’s about embracing uncertainty, loving a friend’s weirdness, exploring mistakes, and exorcising demons. The music has been called goopcore, and electronic primitivism, and worse. Their improvisations flow from harsh electronic noise to gentle acoustic strummings and back, held aloft by otherworldly ambient textures and/or simple vocal harmonies. As a special pre-Halloween event, the improvisational group Light Upon Blight will improvise a film score to the silent movie classic “Haxan: Witchcraft Through the Ages” on Friday, Oct. 30. The performance begins at 8 PM and there is a $5 cover. Narration will feature the pre-recorded voice of legendary Beat Generation author William S. Burroughs. The band urges the public to “come on out to this one time event and help us summon up some ghouls, ghosts, and goblins on the eve before Halloween.” Costumes are absolutely encouraged. For this show, Light Upon Blight will feature Jeff Cedrone (guitar, synth, electronics), Pete Brunelli (bass, electronics), John C. Miller (modular synth), Tom Hogan (drums) and Tony Pellino (synth, guitar). Swedish and Danish pictures easily hold the palm for morbid realism and in many cases for brilliant acting and production. Witchcraft made by [Danish director] Benjamin Christensen [funded by a Swedish production company], leaves all the others beaten. It is in reality a pictorial history of black magic, of witches, of the Inquisition, and the thousand and one inhumanities of the superstition-ridden Middle Ages. Many of its scenes are unadulterated horror. The improvisational group Light Upon Blight will improvise a film score to the silent movie classic “The Cabinet of Dr. Caligari” on Thursday, June 18. The performance begins at 8 PM and there is a $5 cover. A case can be made that “Caligari” was the first true horror film. There had been earlier ghost stories and the eerie serial “Fantomas” made in 1913-14, but their characters were inhabiting a recognizable world. 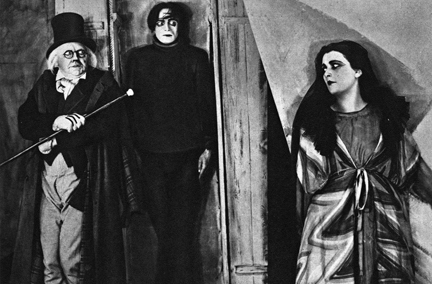 “Caligari” creates a mindscape, a subjective psychological fantasy. In this world, unspeakable horror becomes possible. “Caligari” is said to be the first example in cinema of German Expressionism, a visual style in which not only the characters but the world itself is out of joint. I don’t know of another film that used its extreme distortions and discordant angles, but its over-all attitude certainly cleared the way for “The Golem,” “Nosferatu,” “Metropolis” and “M.” In one of the best-known books ever written about film, From Caligari to Hitler, the art historian Siegfried Kracauer argued that the rise of Nazism was foretold by the preceding years of German films, which reflected a world at wrong angles and lost values. In this reading, Caligari was Hitler and the German people were sleepwalkers under his spell.